Capture musical inspiration. Engrave a beautiful score. Share your artistic vision with others. Just as every musician is unique, so are the reasons each uses Finale software to write music. Finale supports you, making it easy to create whatever music notation you can imagine and to work in the manner that best supports your creativity. No matter where your inspiration leads you, from a simple lead sheet to preparing your Hollywood film score, Finale is the trusted route to the very best output available. 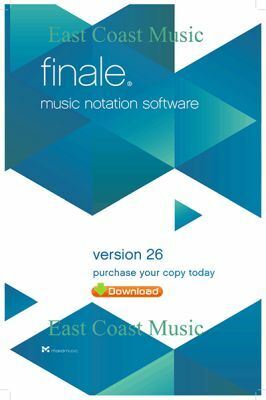 MakeMusic Finale 26 notation software makes it easy to generate publisher-grade music notation that plays back with world-class sounds. Featuring over 500 premium Garritan instruments and Human Playback, your music becomes a life-like performance. Customize your workflow with flexible note entry options that include mouse and computer keyboard, MIDI keyboard, and import from a broad range of file types. Share your creations as sheet music, audio files, MusicXML and MIDI files, and PDF files. From lead sheets and guitar tablature to band charts and full-orchestra scores. Great sounds inspire you – and your audience. Finale’s exclusive Human Playback can make any music playback with the nuance of a human performer. Plus Finale includes a vast library of world-class Garritan instrument sounds for stunning realism. For professional composers, every scoring project comes with suffocating deadlines — and there’s no room for mistakes. That's why music pros use Finale. Finale is battle-tested and continually evolving with new, smart features requested by power users who know what it takes to get the job done. Finale 26 — the result of decades of sophisticated development — lets you turn the music in your head into bulletproof sheet music. Finale gives you complete control over the creative process, adapting to how you want to work. At every rehearsal or recording session, you'll be confident that your parts are ready, you have clearly communicated your musical vision, and that your score will sound great! Auto-Stacking Articulations — Add more than one articulation on the same note, such an accent below a fermata, and they stack intelligently and automatically, reducing the need for manual positioning. Slur/Articulation Interaction — As you add slurs, existing articulations automatically adjust to avoid collisions, and will continue to do so if you move things later. Finale understands what should go inside or outside a slur and will even split up stacked articulations to make everything fit. Horizontal Centering — Automatically centers articulations on both noteheads and stems based on your settings and allows you to instantly flip articulations from notehead side to stem side (or vice-versa). Expanded Libraries — Newly optimized for ease of entry, Finale's included articulations and expressions have been expanded and refined to look great, greatly reducing the need for you to create them from scratch. Chord Symbols have similarly been overhauled for maximum intelligibility, elegant appearance, and fast entry. More — Finale 26 also includes many new templates, Smart Shapes, performance enhancements, bug fixes, and features to help you more quickly create your music.